This week at iheartfaces the theme is silhouettes. I had planned to try getting some silhouettes of the kids this weekend, but we had a gloomy, wet weekend. I even practiced the weekend before on inanimate objects and even got a couple walking with a stroller (I don't think it is good enough to submit though, because the stroller and guy were cut off by trees). Anyway, this picture is the only decent silhouette I have. 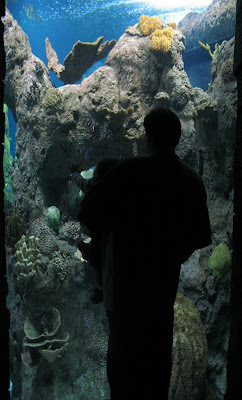 I took it when my son was just over a year old at his first visit to the aquarium. I love how his hand is reaching out touching the glass. I miss him being that little, but at the same time I'm so proud of him and the things he can do now. that is a really cool shot! great job. Such a cool background! Great shot!